Inspired by our recent oceanic visitor to the Firth of Firth – a humpback whale – this is a unique, one of a kind necklet made from the bowl of an antique sterling silver teaspoon. Each necklet is meticulously handcrafted with uniqueness and individuality in mind. 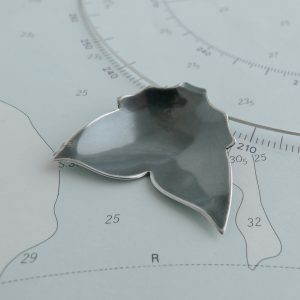 The surface of the silver has a slightly brushed/frosted finish which is oxidised – turned black – and then polished and the edges have been beautifully burnished to give the pendants a lovely bright silver edge. Hung on 40cm / 16″ simple cable necklet with a bayonet clasp. 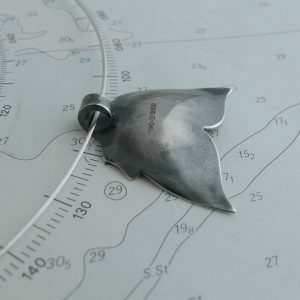 The photograph shows the exact pendant you will receive.